Toyama Ryu was established in 1925 at the Toyama military school in Tokyo. 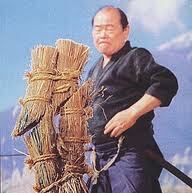 It was formed by a committee of swordsmen, the senior of whom was Nakayama Hakudo. The Fujiyama School teaches Toyama Ryu as taught by Nakamura Sensei, one of the original instructors at the Toyama Academy. The style is a Batto-do, it starts from a standing position which is particularly useful to students who are unable to kneel. 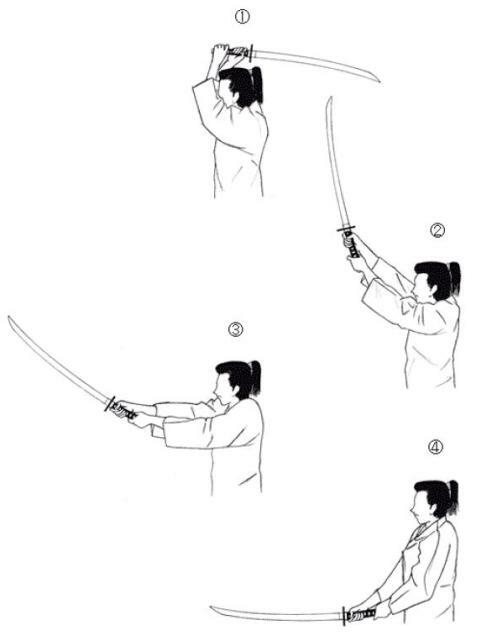 There are 8 kata which teach the student to cut in different directions and use both single- and double-handed cuts. Tameshigiri is also an important part of the Toyama Ryu style and the Fujiyama School practises this on a regular basis. In the Toyama Ryu style, Tameshigiri (test cutting) is a very important part of the syllabus. We at the Fujiyama School practise regularly with the senior students. It is very important for the students to realise how it feels to cut a target, and is important for their developement to see the hasuji (angle of cut). We use targets, soaked for three days and then allowed todry for one day, these are then mounted on a stand which the students then cut. Each target is checked for angle and cleanliness of cut. This is the best way to check that a student is cutting correctly. There are a number of cuts to be practised and these are part of the syllabus, the first are kesa giri left and right, these are learned in the first 2 Toyama Ryu kata. Then reverse kesa is practised, again both left and right, then students go on to suihei, straight across, left to right and right to left. This is probably the harder cut to master as it is very easy to knock the stand over and the correct angle of cut is very hard to achieve. Once these basic cuts have been mastered there are combinations that test the student even further, ranging from multiple cuts on one target and cutting through several targets at once. Remember, Iai Batto-do without Tameshigiri is like a Ferrari without wheels. You can sit in it and play, but you'll never know how it performs, and Tameshigiri without Iai Batto-do is pointless. Please do not think that as soon as you join the club you'll be cutting the same week, Tameshigiri is potentially a very very dangerous art, and all of the senior students are well trained in both safety and technique. You will need specialised training to perform an accurate cut on a mat, and at the Fujiyama School we are proud that we have instructors trained in Tournament Tameshigiri and access to some of Japan's best Tameshigiri exponents. The Fujiyama School arranges Tameshigiri Seminars on a regular basis and students are invited from other schools, however as places are restricted (for safety reasons) priority will be given to members of the Fujiyama School, please contact us for details. We use targets, soaked for three days and then allowed to dry for one day, these are then mounted on a stand which the students then cut. Each target is checked for angle and cleanliness of cut. This is the best way to check that a student is cutting correctly. There are a number of cuts to be practised and these are part of the syllabus, the first are kesa giri left and right, these are learned in the first 2 Toyama Ryu kata. Then reverse kesa is practised, again both left and right, then students go on to suihei, straight across, left to right and right to left. This is probably the harder cut to master as it is very easy to knock the stand over and the correct angle of cut is very hard to achieve. Once these basic cuts have been mastered there are combinations that test the student even further, ranging from multiple cuts on one target and cutting through several targets at once. Please do not think that as soon as you join the club you'll be cutting the same week, Tameshigiri is potentially a very very dangerous art, and all of the senior students are well trained in both safety and technique. You will need specialised training to perform an accurate cut on a mat, and at the Fujiyama School we are proud that we have instructors trained in Tournament Tameshigiri,and access to some of Japans best Tameshigiri exponents. Each school will have many additional rules that apply before, during and after training. While these rituals may chafe to the Western student at first, everything – no matter how obscure it may seem is done for a reason in the Japanese sword arts. Some of these rules are designed to show that your intent in the training hall is to learn and to avoid behaviour which is threatening or dangerous. Others are aimed at cultivating the correct mindset to build a solid foundation of humility and openness (once you think ‘I’m so good at this!’ you’ve instantly stopped learning and are in fact doing yourself a disservice). However, with that in mind, from an academic point of view, here are three of ‘generic’ cutting techniques. 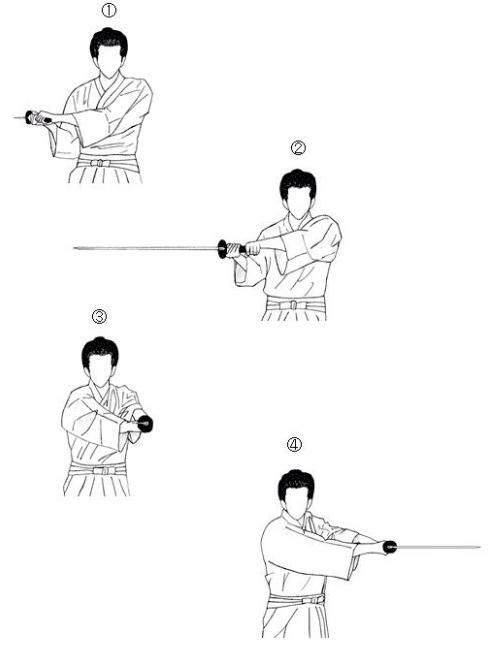 The core of Japanese sword training is undoubtedly the ritualistic patterns known as Kata (forms). These vary from school to school, but all the major categories of Japanese sword training arts – Iaido, Kenjutsu and Kendo have them to some degree or another. Contained within these seemingly archaic movements are many lethal techniques that, ideally at least, are based on tried and tested combat techniques. (It has been argued that some schools are more ‘pure’ than others, with some supposedly being diluted during Japans long period of domestic peace – though the frequency of duels between Samurai would suggest that truly ineffectual arts would not have been passed down through the generations, natural attrition would take care of that!). Again, learning the Kata is really something that should be left to the dojo, however there are some high quality instructional DVDs and Books on the market that while they cannot surpass the kind of Japanese sword training available in the dojo – are a valid alternative for those who are casually interested, or where geography makes practical instruction an impossibility. It should come as no big surprise that free sparring with live blades is not a part of Japanese sword training, though at the highest levels, Masters perform partnered exercises with razor sharp Shinken. In Kenjutsu, once the basic Kata have been ‘mastered’ to a high level, high level students may begin introducing additional techniques into their partnered Japanese sword training Kata which can become so fluid it is, for all intents and purposes, free sparring. And within some schools – free sparring is developed with heavily padded bokken known as fukuro shinai. However, the style of Japanese sword training that truly specializes in free sparring is Kendo. On the downside, Kendo is much more of a sport than a martial art per se, and the wrist flicking strikes employed can create bad habits for Japanese sword training with a shinken (live blade) or iaito – though one the other side, it does indeed cultivate a strong warrior spirit and is most certainly a test of skill (for more information on Kendo, visit The British Kendo website."